The text that follows comes, with slight adjustments, from last year’s personal journal of September 12, 14, 16, and 19-21. The fact that I spent so much time reporting and commenting on this book (Paul Woodruff’s First Democracy) attests to the importance I gave it at the time and that I still give it. I hope my readers find my notes – excerpted over the next few weeks – useful and provocative, in the best sense of the word. Tuesday, September 12 – Aside from the series of translated texts that my friend Charles Allen gifted to me (gifted, as a verb, though until recently I have sneered at the usage, does have its utility), a few months ago he unloaded on me a few texts of a political nature. Out of the ones I selected from the stack he showed me, First Democracy: The Challenge of an Ancient Idea, by Paul Woodruff (2005. Oxford University Press. 284 pages, with notes and index), is the one that stood out in my mind as a priority, should I only get around to reading one of them. Last night I completed my reading of it. It contains so much that is both timeless and painfully pertinent to the moment’s decline of our democratic ideal, that it is certainly one of the most (if not the most) important politically-focused books that I have ever read. If anything can get me focused enough, in the general principles that our nation’s and world’s future depends on, to pull me out of the despair that I am so often on the verge of spiraling into, this would be the book. Another of those books, with its focus on Classical rhetoric and the wrongly-maligned sophists who were so important to the practice of “First Democracy,” as Woodruff calls the ancient Athenian model, is the investigative journalist I. F. Stone’s The Trial of Socrates, which I borrowed from the University of Southern Indiana’s library for a report in Professor Thomas Rivers’s “Contemporary Issues in Rhetoric” course in the summer of 2000 and, so, do not have a copy in my library. It is a book that revolutionized my perspective on the old aristocratic philosophers Plato and Socrates, with their anti-democratic bias. 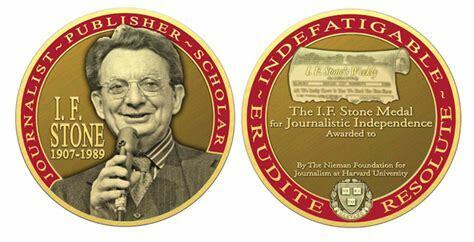 Since then, I. F. Stone’s name has come up here and there, recently on Charles’s tongue. The first thing that caught my attention when I finally sat down to read this book not too long ago, was Woodruff’s two-page dedication to Stone. One thing Woodruff does is to give a more balanced view of Plato and Socrates, what they got right as well as wrong, but he makes it equally clear that they were, indeed, enemies of democracy, however legitimate some of their concerns may have been. “I cannot pretend that mine is the kind of book he would have written,” Woodruff writes in that dedication. “It is too short on detective work, too long on theory, for him. But not, I hope, too short on idealism. During the year that I saw him almost daily, I would sometimes despair about American democracy, or about human educability, or about anything, really. Then he would gently pull me back. ‘It should be,’ he would say, reminding me not to let my dreams be trimmed to fit our current failures. Democracy should work, he meant. Education should support it. And so on” (p. vi). “Democracy is government that tries to bring a specific ideal into practice – the ideal of government by and for the people. I call it an ideal because I do not think it has ever been fully reflected in an actual government” (p. ix). 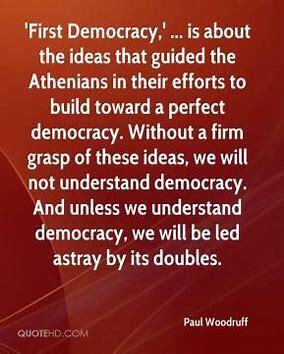 In his introduction (“Democracy and Its Doubles”) Woodruff posits that democracy, “like many beautiful ideas,” “travels through our minds shadowed by its doubles – bad ideas that are close enough to be easily mistaken for the real thing.” The ancient Athenians “tinkered with the system for nearly 200 years,” he continues,” “and it was working smoothly when the overwhelming power of Macedon brought it down. Alexander the Great inherited despotism from his father Philip, and he passed it on to successors who maintained it for generations. It was this despotism that killed democracy” (pp. 3-4). The Athenians knew what democracy was, and sustained an ongoing debate about the ideas – central to the book’s focus – on which it was built. But we Americans, even the most educated among us, do not understand it – and are “complacent in [our] ignorance.” Sometimes, in our attempts to define it, we fall back on the Constitution, “forgetting that this was written by men who feared government by the people and were trying to keep it at bay. “The Constitution,” he writes, “is a magnificent solution to the problems faced by the founders but it is not democratic in itself and the virtually scriptural authority that it now enjoys is a drag on the evolution of democratic processes in the United States. Perhaps that is a good thing,” he adds; “the founders may have been right to insist that republican institutions would serve us better than democratic ones. But we should call things by their right names, if we are to avoid confusion. A republic is not necessarily a democracy. The Athenians were not held by by a written constitution. Instead they had an oral tradition that served mainly to preserve a handful of essential ideas, while the system itself could evolve through democratic processes” (p. 4). The Athenians knew what democracy was, and sustained an ongoing debate about the ideals on which it was built..
“When Athens was true to democracy,” Woodruff writes, “it was gloriously successful.” And the Athenians tended to learn from their mistakes, making adjustments that improved it, though its failures were dramatic. “Athens’ failures frightened many thinkers away from democracy. Historians and philosophers of the time saw the dark side of Athenian politics more clearly than the bright, and they tended to blame the dark side on democracy. 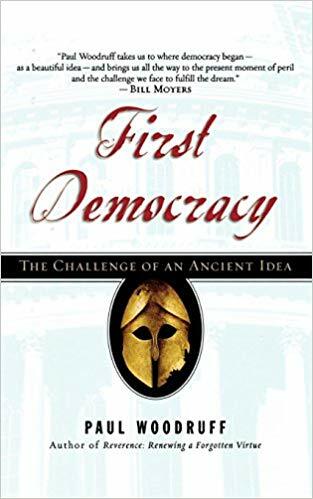 They passed their judgments down to succeeding generations of thinkers, with such success that democracy carried a bad odor for over 2,000 years” (p. 5). So here we are today, in an age where we are keen on exporting our own freedom in the name of democracy, while our presidents “often take cover behind executive freedom – even though this belongs more to monarchy than democracy” (pp. 6-7). Woodruff admits, again, that its enemies have a powerful case against democracy, but his “hope in this book is to bring democracy out of the shadows of complacency and suspicion, and into the light where its essential ideas may be debated” (p. 7). Those central ideas, which occupy most of the book, are seven: 1) Freedom from Tyranny (And from Being a Tyrant); 2) Harmony, which in a sense might be the most vital; 3) The Rule of Law (these three being present in all ancient concepts of government, the others pertaining strictly to democracy, and thus more controversial); 4) Natural Equality; 5) Citizen Wisdom; 6) Reasoning Without Knowledge; and, 7) Education. The three of democracy’s “doubles” that Woodruff focuses on in the introduction are: 1) Voting; 2) Majority Rule; and, 3) Elected Representatives. 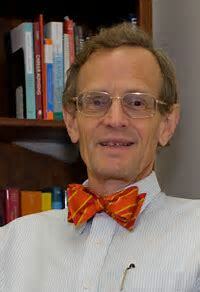 The problem with voting is that it is a process that can be manipulated, leaving many feeling that they have no real voice; “what is crucial to democracy,” he writes, “is how issues and candidates are chosen and presented for voting” (p. 10); this is why Professor Rivers always said that civic participation and discussion are the supreme civic virtues, not voting. As for majority rule, it often is no more than mob rule; and, in a two-party, winner-take-all system like ours, only the winners feel truly represented in the resulting governance. 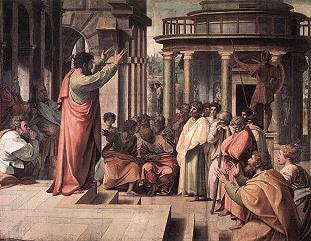 Likewise, while some representative bodies were necessary in Athenian democracy, the Athenians severely restricted the powers of elected officials and filled representative bodies by other means that prevented bribery from entering into crucial decision making – this in the interest of keeping an excessive power out of the hands of the wealthy. Underlying the seven virtues are others “such as justice and reverence” – reverence having more to do with humility than anything, a knowledge of the limitations of human knowledge and, thus, a check on excessive pride, or hubris – “but these are so widely admired that they do not pick out a system of government” (p. 15). In the end, this introduction comes back around to the notion of idealism that Woodruff attaches to the example of I. F. Stone. And here lies some really beautiful writing. “Call democracy a dream, if you will, but keep dreaming democracy,” he writes. “I admit that visions are unrealistic; they are supposed to be unrealistic. ‘Being realistic’ leads to stagnation and an easy accommodation with failure. We should always want to work out better ways of being democratic. We should always be looking for systems that engage more citizens in decision making, for public education that gives more people the tools of self-governance, and for courts that deliver more credible justice. In short, we should want to move closer to the ideal. But how can we do so without a vision of where the ideal is? “We can’t. And in the absence of vision, we are not making progress towards democracy. Quite the opposite. As I write this book, the United States seems to be edging further away from the essential principles of democracy. The growing political power of wealth undermines equality, the retention of prisons abroad on a base on Cuba threatens rule of law, and the rising number of electoral districts that are safely in the hands of political parties reduces the value of people’s votes. You may wish to defend these trends, but you should know what they mean. “The enemies of democracy are fear and ignorance. Fear feeds on ignorance, and fear leads to ignorance. Frightened by the many dangers around us, we may be tempted to trade our freedoms for what look at the time like safety. 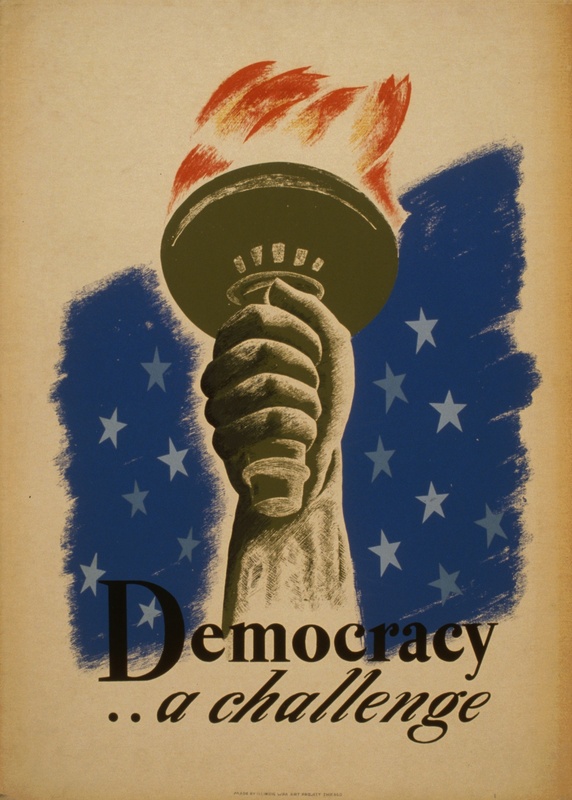 Lacking a clear vision of democracy, we may not realize that when we traded away our freedoms we were trading away part of democracy itself, since freedom and democracy are inseparable. Or, in the excitement of winning an election or a lawsuit, we may forget that democracy is for all the people – for the losers as well as the winners in the latest contest. 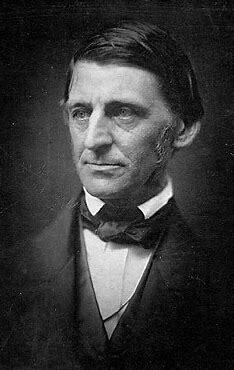 This last line puts me in mind of what our great national philosopher, Ralph Waldo Emerson, of the American Transcendentalists, meant when he spoke of self-reliance. To be a man, he said, one must be a nonconformist. The true “American Scholar,” to borrow from another of his most brilliant essays, is the one who depends on his own seeing, and who is not hide-bound to either the light of others or the lights as he saw them yesterday. A foolish consistency is the hobgoblin of petty divines and small politicians. We are beholden, Woodruff would add, to the former vision of the ancient Athenians not so that we can duplicate and mindlessly follow them in a completely different political and cultural environment, but so that they can suggest to our minds the great applications of those seven basic ideas to the particular circumstance we face. And this, I believe, is a good place to leave this discussion for the night.